I have heard this quite a lot from people who are enthusiasts of the vast and deep ocean. My eyes were opened to this fact the moment that I started diving. Indeed, it holds creatures of various species that live in tranquility underneath the sea. Every dive is a chance of meeting a new friend, an amazing resident of the abysmal brine. Also, the diving experience itself, I must say, is something that my body craves for since it feeds and satisfies my soul that is longing for peace, calmness and suspension in freedom and fluidity that I can only find in it. I see the ocean as an alternate universe where there is absence of chaos, materialism, surge of fleeting emotions and inauthenticity. Imagine this feeling of calmness brought by the ocean coupled with bloody gorgeous sunsets at dusk, sounds of the tides crashing on the walls, star-sprinkled pitch black skies at night, impossibly perfect morning hues on daybreak, the sun creeping gracefully shining light over the landscape and endless horizon. These are the events that made my weekend worthwhile and I have experienced all of these in my stay in Summer Cruise. 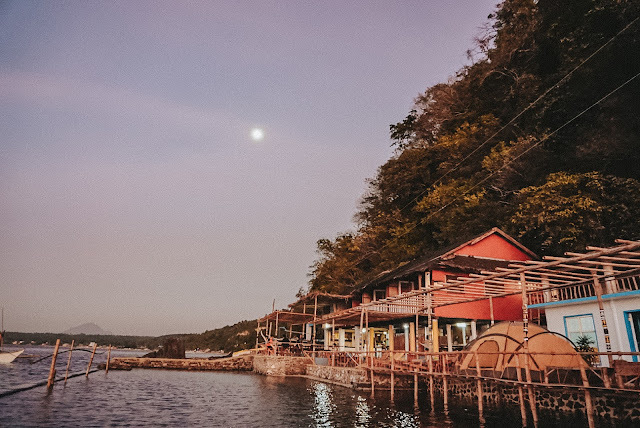 Summer Cruise is a diving resort located in Brgy. Balite, San Luis, Batangas and is two hour away from the metro. It has been running for eight years now - eight years of introducing its guests to the amusing life underwater. Recently, they have done some re-branding, giving the whole place a revamp and new lively colors. This transformation has invited several tourists to come over the place and enjoy its chill vibes and the activities that they offer. Though Summer Cruise & Diving is nestled several meters away from the marine sanctuary itself, open water activities can still be best enjoyed around the area. 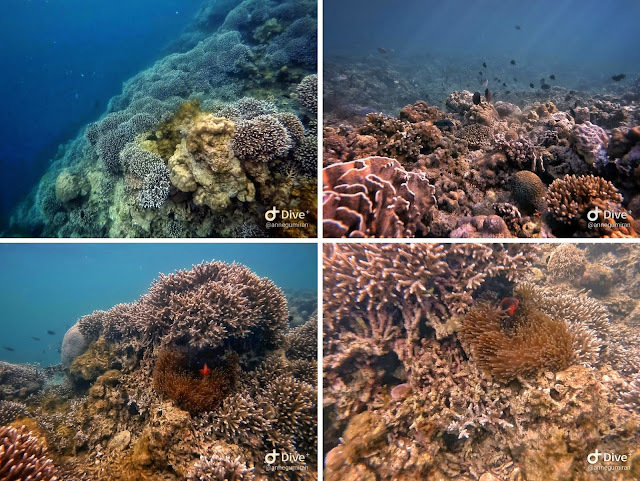 There is actually a stretch of coral beds with a variety of soft and hard ones and fishes of several species on the left side of the resort (if you're facing the ocean) thus, snorkeling, diving and SCUBA diving is always a good idea. 1. Snorkeling. 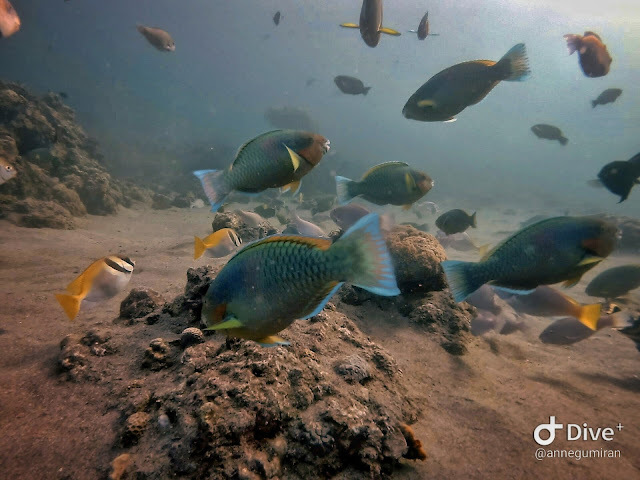 For those who are non-swimmers, this activity can still be best enjoyed as there are spots around the resort where coral beds beautifully thrive and several species of fishes can be found. 2. Skin Diving. 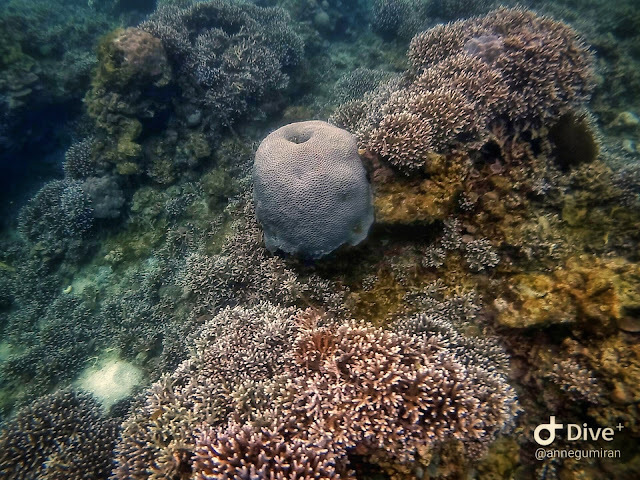 If you can go few meters deep, you'd be able to follow and swim with the other species of fishes and get a good view of the soft and hard corals underwater. 3. 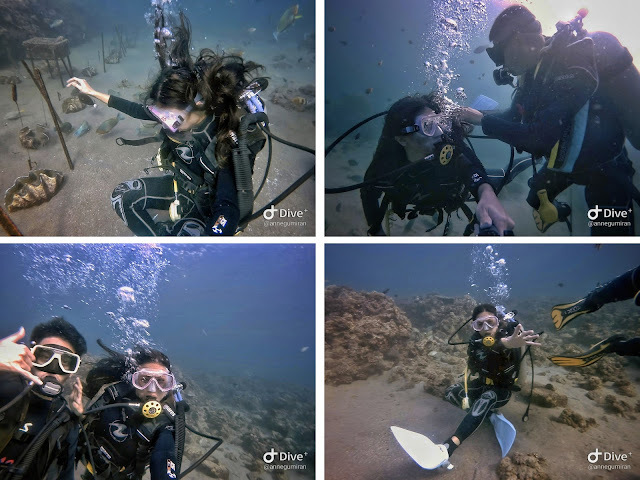 SCUBA Diving (Intro Course). 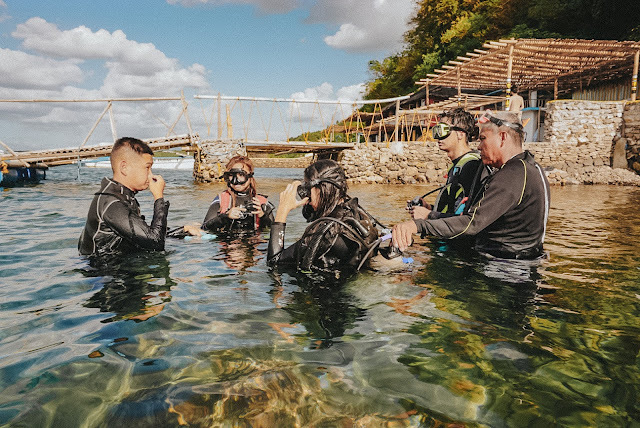 They also offer intro to SCUBA diving in which the rates include complete diving gears and equipment, entrance and environmental fees and a dive master. A swimmer or not, you can enjoy the ocean at 10 meters depth and get to stay for long without worrying about oxygen. Worry not for they will brief you about how the gears are used and some trouble shooting prior to the activity. Before the actual diving, we had a short briefing about how the equipment are used and some troubleshooting. 4. SCUBA Diving Certification. For 14,800 Php, you can already get your training and SCUBA diving certification for two days in Summer Cruise under PADI. 5. Table Tennis. They have a table tennis that is available for the guests. This is free of charge. 6. Rod Fishing. There is only an area where rod fishing is allowed. Should you want to engage in this kind of activity, you may rent a fishing rod from the resort. 7. Photo Ops. There are various spots around the diving resort where you can take your Instagram photos. Among those are the following. These are among the photos that we took on the best spots of the resort. Quite a place for a fun shoot! 8. Watch the sunset. The place is also a good spot to watch the glorious sunset. The resort also offers authentic hearty Japanese goodness in bowls which starts at 250.00 php. They would normally put up a board at the common area in which the menu of the day is written. They can cook for you at anytime of the day. These are good enough to replenish you after a tiring water activity that would surely get you famished. All of their meals include warm soup that really tastes ten times better after getting off the waters. Their drinking water is also free for everyone who visits the place. Should you want to save up some bucks, you can bring your own food. They do not collect corkage fees for such. However, you'd have to pay an amount of 50php/ head per cooking if you will use their kitchen. They have sodas in the resort but not booze. You can bring, though, and enjoy the night with it. However, guests are advised to stay in the common area only up to 9:00 PM. This fan room can accommodate up to four persons and it features a balcony with accordion glass door with an ocean view. It has its own bathroom with hot and cold shower. There are two double beds with pillows and blankets and few pieces of furniture where you can put your things as well. There are power outlets in the room and a reading light, too. There are four rooms in the main building of the resort in which all of these are located at the second floor. All the four rooms has a view of the ocean with two of it having a balcony (C and D) and three has its own bathroom (A, C, D). Guests who would be checking into Room B would have to use the common bathrooms downstairs. The simple rooms have two or three double beds in it, reading lights, power outlets, pillows and blankets, towels and electric fans. There are two rooms located at the other building. 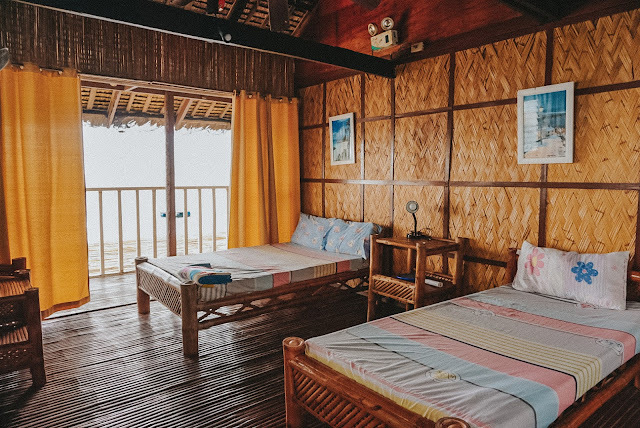 Unlike the other ones in the first building which are rustic-themed with walls and floors made of bamboos, these two are concrete with a touch of Mediterranean vibe with its walls painted white inside and out and a Santorini-inspired interior design. These rooms can accommodate two persons with each having two beds, fan, blankets and pillows, mattresses and fans. 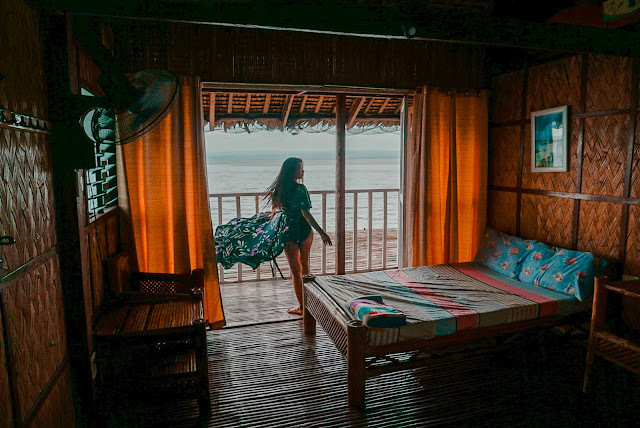 Shall these rooms be fully booked, you may also engage into a glamping (glamorous camping) by staying at the tent set up in the lounge of the resort. They have a large tent that can accommodate up to four persons equipped with mattresses, blankets, pillows and a fan. 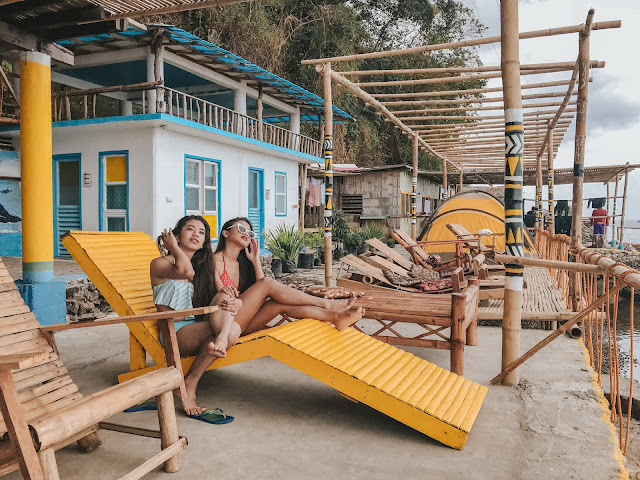 If you are to stay on a day tour, you may rest comfortably and in style in the wooden reclined beach chairs for a more laid back way of enjoying the ocean and the landscape in front of you. 1. Make your way to Buendia (near Gil Puyat LRT Station). Take a bus with Lemery Tambo Exit sign (DLTB Co.). Fare is at 175 Php. 2. Alight at Xentro Mall. 3. Take a tricycle to San Luis, Brgy. Balite or Summer Cruise Parking A or B. This may take 15-20 minutes and fare is at 200 Php which can be haggled down to 150 Php per ride. 4. You may either walk your way to Summer Cruise for 15 minutes or ask them to pick you up with the boat for 50php/ head. 1. Make your way to Star Toll and take the Lipa Exit. 2. Drive through the national highway from the exit to Cuenca, Alitagtag then turn left when you see PLDT before Santa Teresita. From there, turn left (when you see a small public marketplace) and take the first right way after several meters. Landmark to this right turn is something like a Barangay Hall in the middle of two diverging roads. This leads you to San Luis. 3. Drive straight to Brgy. Balite and look for the signages "Binukbok parking A or B" or Summer Cruise parking A or B" at the right. 4. Contact Kai so he can send someone to pick you up in the parking. In getting away, most especially if you are commuting, make sure that you'll leave the resort at least few hours before 7:00 PM. Public transport which travels out of Batangas (i.e. the ones in Lipa) are only up to 7:00 PM. Otherwise, you'd have to wait for the next day for you to be able to get away. You can take public transport out of that area of Batangas in the Grand Terminal (at SM City Lipa). Though there are also few in Xentro Mall Lemery, the schedule becomes indefinite as it gets later. -If you are to bring your car, parking fee has to be paid. If you will be commuting and passing through the parking to the boat, you'll pay 10php per head. -Not all rooms have washrooms. There are rooms in which you have to use the shared bathroom at the common area. -Make sure that you have contacted Kai Takagaki prior to your visit so he could make the necessary preparations. -There are no convenient stores in the area. The nearest ones are found near the parking. Thus, you may need to walk for 10-15 minutes to get into the nearest one. -There is electricity and water supply in their resort. 10:15 AM - Dive. Dive. Dive. * Take note that you can't SCUBA dive and free dive on the same day. Tip: If you think that it is too early to depart from Batangas, you may go on a side trip in the Heritage town of Taal. You may just ask the tricycle driver to drop you off Taal Basilica. The sample budget considers a group of three on a weekday with intro to SCUBA and skin diving/ snorkeling on the next day. 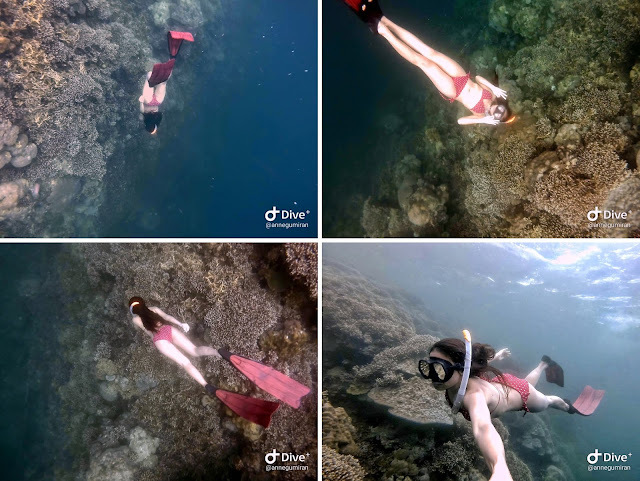 I did a Clean Up Dive in Batangas! Yes, you read it right. I did a clean up dive as we did skin diving on the last day of our stay. I didn't have any plans to as I was expecting that the ocean will be taken a good care of as it is just nearby the marine sanctuary. I was completely wrong. 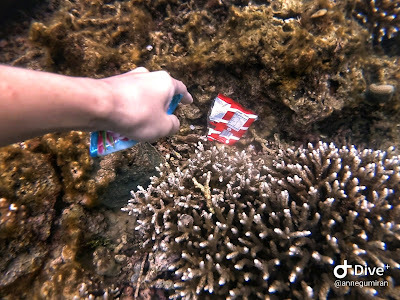 As we were snorkeling our way to the spot where the corals were thriving freely and beautifully, I could sea plastic stuck in between them. There were wrappers of food, sanitary napkins, diapers, plastic bottles and more. My heart sank at the sight. I can't be just there staring like a hypocrite when I can really go dive that deep yet do nothing with it. 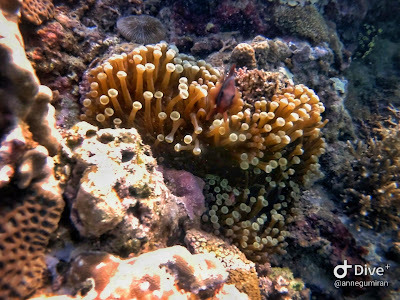 I could not not take them as they really are an eye sore to the stunning coral reefs and gracefully swimming fishes. So occasionally, I would go meters deep, push my limits and go beyond my usual diving depth just to get the eye sore out of the view. I was a bit rejoicing as I was able to lift the plastic out of the ocean not until we came into the shore. There were even more trash that can be possibly carried to the waters shall the tide goes up. They were not carried by the waves. I know in my heart that they were intentionally left in there. I tucked some in and brought with me as much as I could and threw them to the bin the moment we came into the resort. It is quite disheartening. I really hope that people for once could think of disposing their garbage properly and not just carelessly letting them lay in there being a threat to the life forms in the ocean.